A field of six will travel 1 1/16 miles at Los Alamitos on Saturday in the $300,000 Los Alamitos Futurity (G1). Trainer Bob Baffert, who has racked up a sensational mark with two-year-old runners in 2018, is well-represented with a pair in the field and he aims to win this event for a fifth consecutive season. FREE Los Alamitos Futurity PPs courtesy of Brisnet.com! Exciting prospect is unbeaten from a pair of career tries to date and exits a powerful 7 1/4-length romp in the Street Sense Stakes at Churchill Downs. February foal prospered stretching out to a mile in the Bluegrass State. Likely one to beat comes in with a bullet five panels and gets the rail for a second route attempt. Colt is imposing for a red-hot jockey/trainer combination of late. Speedy colt has ascended from a maiden claimer graduate to a juvenile with a pair of recent stakes placings. Bob Hope Stakes runner-up removes the blinkers here in advance of his two-turn debut. February foal draws well near the fence and will be leading or forcing the pace from second in early going. 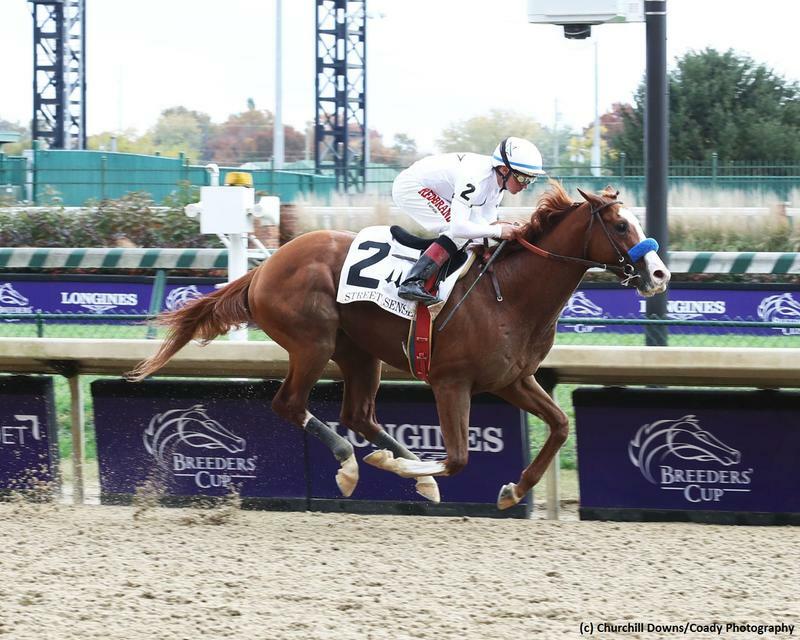 Interesting colt was an even sixth in the deep Breeders’ Cup Juvenile (G1) in a first with blinkers on. The $475,000 yearling purchase had fine form prior to the Juvenile with a trio of good maiden showings while in with tough foes, capped by a strong tally two prior going one mile. Kentucky-bred will be fit with four morning drills in the interim. Gray colt looks like the main danger to the Baffert duo. Kentucky-bred already has seven races under his belt, including five straight on the green coming into this one. Dual stakes hero didn’t handle the yielding going at Churchill Downs last time but he has class and a fine turn of foot on the sod. Colt switches to dirt and Desormeaux to see if he can run with this kind on the main strip. Bob Hope fourth was an 8 3/4-length maiden romper in a race at this contest’s distance two back. First foal out of this Tiznow dam will love the trip once again and will benefit if the two speedsters in the field knock heads from the start. Late runner continues to train in consistent fashion for an expert horseman. Second runner from the Baffert barn moved his mark to a perfect two-for-two with a visually impressive Bob Hope Stakes triumph. The $625,000 juvenile purchase has yet to be headed from a pair of races and stretches out for the initial time at Los Alamitos. Improving chestnut has the pedigree to thrive going a route of ground and the outside draw could be of benefit to him and Talamo.